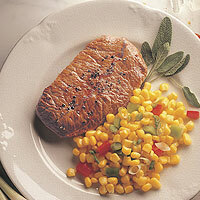 Corn relish is a refreshing accompaniment alongside a nice thick steak. Relish:Heat oil in large nonstick skillet over medium heat until hot. Add bell pepper; cook and stir 3 minutes. Stir in corn, vinegar and ground red pepper; cook 2 to 3 minutes. Remove. Beef:Heat same skillet over medium-high heat until hot. Place beef steaks in skillet; cook 3 to 5 minutes for medium rare to medium doneness, turning once. Remove; season with garlic salt. To Serve:Return corn relish to skillet. Add green onions; heat through. Serve with steaks.